This monograph is the result of a study carried out for a research programme on Moving Out of Poverty of the University of Sussex and sponsored by the DFID (UK). A three-country study on the Impact of Migration to the Construction Sector on Poverty was administratively coordinated by the Refugee and Migratory Movements Research Unit (RMRRU), Bangladesh and the India study was part of this three-country study. The overall research programme was coordinated by Priya Deshingkar at the University of Sussex. In India, this study was housed with the Institute of Human Development (IHD), New Delhi. Millennium Development Goals (MDGs) are an outcome of the UN Millennium Declaration of September 2000 in which 189 nations of the world committed to provide the right to development to the worldÂ’s population, with a human rights approach by 2015. The concept of MDGs is a comprehensive approach and offers a coordinated strategy which aims to tackle many problems simultaneously. Throughout the globe, the MDGs are being monitored systematically and the progresses made are evaluated periodically to achieve the goals and targets. Government of India has recently brought out the Millennium Development Goals Â– India Country Report 2014. Prior to this, MDG Â– India Country Report was published in 2012. These reports are prepared by the Social Statistics Division (SSD) of the Ministry of Statistics and Programme Implementation (MOSPI), Government of India. In the 59th meeting of the National Statistical Commission (NSC), held on19 and 20 August, 2013, the Commission felt that the State level MDG reports should not be developed by the MOSPI and that they should be developed by the states as per the Social Statistics Division (SSD) framework. NSC took up the matter with the Planning Commission suggesting it to advise states to prepare state MDG Reports as it is done in the case of Human Development Report for states and districts. The Planning Commission subsequently requested the states to commence the work relating to the state level MDG reports in the framework provided by MOSPI. By Preet Rustagi, Soumya Kapoor Mehta, Sunil Kumar Mioshra, Balwant S. Mehta and Ramya Subrahmanian. The report draws on a framework developed by UNICEF for a global analysis on child poverty, which endorses the UN General Assembly?s recognition of ?child poverty as an area of concern?. The objective is to look at conventional poverty and demographic data through the lens of child well-being and also to explore achievements in the numerous interlinked dimensions of basic rights for children across vectors of wealth, gender, location and social group. By basic rights are meant a certain core minimum set of material and non-material needs that are required for a child to grow into a healthy adult and avail opportunities available to him or her in the society. The report attempts to bring an equity lens through which to review India?s progress on social development by disaggregating the indicators from the perspective of children?s well-being. This study was conducted to ascertain broad insights into the status of women in rural Bihar with a view to examine any signs of transformation in work and gender relations. The main objective was to ascertain broad dimensions pertaining to women?s lives with respect to their work, their access to basic amenities, the impact of male migration on women and children, and the influence of public policies. An attempt was also made to gauge the changes over time, if any, that may be either transforming women?s lives or have the potential to do so. 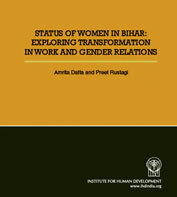 The nature and extent of transformation in the status of women with respect to work and gender relations was explored over time by eliciting information on economic, political and social aspects to ascertain whether transition towards gender equality and empowerment has been witnessed in rural Bihar. The study was based on a survey of groups of women in 14 selected villages across 9 districts of north and south Bihar. For 12 of these 14 villages, this study was linked to a village resurvey undertaken by the Institute for Human Development (IHD) within the umbrella of its research programme on the Dynamics of Change over 30 years (1980-2010) and the Emerging Policy Framework. The study has been published as an IHD monograph in 2012. "New Publication out: Allâ€™s Well that Ends in a Well: An Economic Evaluation of MGNREGA Wells in Jharkhand"